Walker Ceramics has produced eight videos (now DVD’s) that thoroughly demonstrate all ceramic techniques in detail. This visual information series has been developed for the classroom, pottery groups and the individual potter alike. We are proudly associated with Australia’s own master potter, Greg Daly, in the production of these workshops. Greg is well known throughout Australia and, indeed, the world. He is represented in both local and international museums and public collections and has been awarded numerous prizes overseas. We feel the student of ceramics has the opportunity to benefit from Greg’s professional knowledge and experience. The DVD’s are copies of the original 1980’s Video Ceramics by Greg Daly. The running time for each DVD is approximately 40 minutes. This video gives a comprehensive illustration of instruction in the craftsmanship of clay. Here the visual finer points of learning the skill of throwing enables the potter to closely follow the throwing movements. Firstly, Greg Daly discusses the basic properties of clay and the methods of preparing the clay body for the wheel to avoid problems in throwing and shaping. The body, arm and hand positioning and movements and the correct mental approach, are all important and are fully covered. The potter must be responsive to the needs of the clay. The progressive development of different shapes from the basic cylinder are completely illustrated. These forms can be created quickly and easily altered in endless ways. Throwing can easily be mastered by anyone willing to practice the methods shown in this video. Includes booklet providing more detailed information on techniques demonstrated. After being able to throw pots, what now? This video gives a clear and instructive illustration of the techniques of turning and allows the viewer to watch a skilled professional at work. The authoritative discussion on the importance of foot design and its many variations is a most important contribution to the excellence of form. The demonstration of hand and tool positions for turning, together with the selected decoration techniques, are all clearly shown step by step. Finally a discussion and demonstration of glazing with some reference to glaze formulation. Includes booklet providing more detailed information on techniques demonstrated. Clay is a beautiful material for the creation of shapes and forms without mechanical aid. Craftsmen are turning their attention to these hand building techniques which so easily give variety of form, expressiveness and little limitation of size. The explanation of shaping clay as a plastic material is the subject of this video. Free form slab building achieves a freshness from clay and you learn its abilities to perform. These forms are finished in various ways by texture, coloured clays, coloured slips, airbrushing and glazing. Precise slab built pieces are developed and finished. A demonstration of the use of different clay bodies is fully illustrated. A comprehensive video recommended to be viewed by any potter. Includes booklet providing more detailed information on techniques demonstrated. This video demonstrates further techniques and their development using coloured clays and twelve ideas in one pot. Having experienced the qualities of clay, shapes and construction in previous videos this video takes you into the fascinating world of colour. Many methods of colouring the clay are shown with the use of underglazes, stains on plaster and the use of slip as a medium for securing colour. The proper handling of work is explained, for example, demonstrating the use of plastic in order to avoid finger marking the clay. All this enables you to develop your own interpretations and gives inspiration for your own experimentation. Also included are demonstrations of insertions, yet another wonderful idea of creating three dimensional effects as well as using little oddments of clay. A most exciting video not only from a firing point of view but on the most simple forms of building kilns as well as a superb range of glaze results. 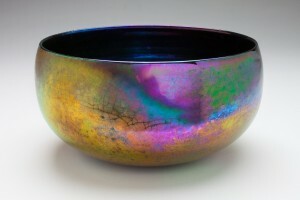 There is a great deal of fun to be had by experimenting with sawdust, oil and Raku. Explanations of using the same glaze in each type of firing makes this a must for your pottery education. Simple forms of kiln building enable you to do so at a low cost. ‘On decoration’ details and aids for decorating are interesting techniques which should give you incentive for your own development. This video incorporates easy step-by-step methods for beginners and introductory school level clay projects, including creating with clay balls, pinch pots and coil pots. Greg begins by showing us how to make slip from dry clay. This slip will be used throughout the video when clay pieces are joined. Using soft clay balls, he creates a clay house, explaining how to build up the walls of the house using very simple hand building techniques and finish the house off with a slab roof. Adding texture to clay is demonstrated with the use of rolled coils of clay and various objects. These coils are then pierced and cut to create beads. Pinch pots are explored in detail. Controlling the form, pinching a variety of forms and adding feet to the pinched form are all shown. Rolling pinched pots in powdered clay to achieve surface colour and texture is explained. Internal pinching to achieve a natural looking cracked exterior is also demonstrated. Using the pinched form, various finishing methods are explained that can be applied at the bisque stage, including staining with oxides to highlight the textured surface and applying glaze with a brush. By joining two pinch pots together, we are shown how to make an ocarina, a South American musical instrument that makes wonderful sounds even before firing. Greg adds a mouthpiece to the basic form created by the two pots and then forms the opening. The correct positioning of the holes is explained so that the correct notes will emerge. The ocarina can then be fired, decorated and glazed. Every child will enjoy making one of these delightful instruments! After demonstrating how to roll coils correctly, enchanting examples of simple coiled animals are created while the construction techniques are explained. These animals are quick to make and are an ideal project when time is limited. Greg then demonstrates the step by step approach to making coil pots using various shaped bases made from clay slabs. Coils are added until the walls of the form are at the correct height. The coils are then merged together by smearing and pinching to create a single form. The technique of adding coils to make the pot flare out or curve in is also demonstrated to enable the viewer to learn how to control a form. Used as a classroom aid for instruction and inspiration, this video contains forty-five minutes of wonderful ideas and helpful hints. This very informative video introduces novices to basic throwing techniques, slab pot construction and various decorating methods, including textural and colour finishes, in a clear and concise format. Beginners will view the methods used to attach clay to the wheel head so that it does not slip off, the use of liquid clay (slip) as a lubricant in throwing and how to achieve the correct wheel speed when throwing. Greg also demonstrates correct body and hand positions for throwing a pot, centring clay on the wheel, opening up the centred clay, compressing the base and throwing cylinders. Helpful hints on how to throw successfully are given along with several exercises to improve throwing skills. Three different methods for making simple slab pots are demonstrated and provide the viewer with plenty of ideas for future projects: cutting clay with wire and cutting guides, rolling slabs with a rolling pin and guides and throwing a slab on a flat surface. The slabs are then built into forms using the different methods of joining leather hard clay with slurry. How to reinforce clay forms by using coils is detailed along with the application of colour using simple stencils. In addition the application of textures using common items such as bark, screws and corrugated cardboard is explained. Many decorative techniques are shown including wax resist, colour washes, sgraffito, combing and slip trailing with engobes. The use of a hand held extruder and the different textures it can create are demonstrated. The comprehensive exploration of decorative techniques, basic throwing and slab construction methods combine to make this video ideal for teaching and a valuable reference source. Ideal for the practicing potter, serious student or senior level ceramic class, this video is informative, technically useful and packed full of creative applications using moulds as a tool. Methods for mixing plaster, including the correct ratios of plaster to water, modelling a positive form in clay for press moulding and using a casting box to cast in are all covered in a clear step-by-step approach. The demonstrations of pouring plaster on to a positive form to create a one piece mould, cleaning up the mould after the plaster has set, how to tell if the mould has dried properly and the removal of the positive form from the mould enable the viewer to fully understand the construction process. Greg then illustrates a variety of creative uses for the press mould. These include the use of different coloured clays, the application of different textures and joining two halves of a pressed form together. Various ways of finishing are demonstrated before the methods for making two piece moulds are explained. This includes the use of release agents, the use of colour to decorate the forms and inlaying different coloured clays in the mould prior to casting. The art of slip casting is explored in detail, including the use of deflocculants, how to pour the slip, the removal of excess slip, maturation times and how to remove the cast form from the mould. The wide range of applications for moulds are touched on and in the final segment of the video Greg shows the viewer the use of a multi piece mould. This video is a source of inspiration and technical expertise that would make an excellent addition to any ceramics library.